Transfer of Memory, a photo exhibition of Holocaust survivors living in Minnesota, at home in full color, opens at the Schaefer Art Gallery at Gustavus Adolphus College on March 22 accompanied by two weeks of programming surrounding the exhibit. 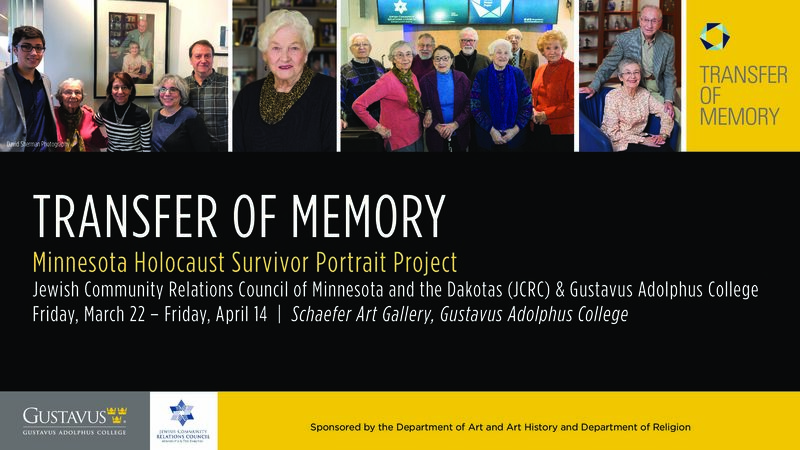 Curated by the Jewish Community Relations Council of Minnesota and the Dakotas (JCRC), the exhibit features portrait photographs of 53 Holocaust survivors with ties to Minnesota. Since 2010, the works seek to connect people to this history, using portraits to forge a connection between the viewer and the subject. Photographer David Sherman captured the portraits in the exhibit. When Sherman was 10 years old, he attended his community’s Holocaust memorial dedication, and the experience had a deep impact on him. Twenty-five years after the liberation of the camps, the survivors who had been children were now adults and active members of the community. “I had no means to understand the grief they showed at the dedication,” he says. “The harsh memories and sense of loss were still new and raw.” Forty years later, the Holocaust survivors are ageing. Sherman, now a professional photographer, captured the faces and stories of the survivors. With the help of JCRC, the exhibit has grown ever since. A number of special events on campus will accompany the exhibit. Samuel Kessler, the Bonnier Family Chair in Jewish Studies and Assistant Professor of Religion at Gustavus coordinated the programming. “The specific programs are designed to highlight aspects of the Holocaust and its legacy, including the stories of how individuals survived during the war years, the memories they carry with them, the legacies of memory carried by children and grandchildren, and the impact on culture and theology of such great evil arising in the midst of European society in the modern era,” he says. As the survivors themselves age, several children and grandchildren of Holocaust survivors have come forward to help tell their family’s stories. Ben Cohen, one of these grandchildren, will give a talk about his grandmother, titled, “Judy’s Promise: A Story of Justice.” on March 25 at 6:30 p.m. in the Schaefer Gallery classroom. Susan Miller will tell her mother’s story on April 8 at 1:30 p.m. in Olin 103. A panel of Gustavus faculty and clergy will discuss “God and Evil after the Holocaust” on March 27 at 7 p.m. in the Schaefer Gallery classroom. This discussion is part of a series of discussions on campus dealing with significant religious issues. Additionally, a film by Now What Studios titled “R4CH43L” will be shown on April 10 at 7 p.m. This independent film is a 15 minute fictionalization of the true story of a young boy from Ukraine whose parents hid a Jewish woman and her children during the Holocaust. The man who the film is based on has lived in Minneapolis since World War II. The creator of the film and some of the actors and production crew will be at the viewing and will partake in a discussion about the film following the showing. This exhibit runs March 22-April 14 in Schaefer Art Gallery. It is open everyday from 8 a.m. to 10 p.m. The exhibit is free and open to the public. There will also be a closing reception in the gallery on April 11 from 4:30-6:30 p.m. More information about the exhibit can be found at http://www.transferofmemory.org/ or https://gustavus.edu/art/schaefer.php.